This week’s election once again showed California as a true-blue state, with Democrats taking the governorship and other top offices in a landslide (though the race for state attorney general remains too close to call). But truth be told, California is a true blue beach state, with the heavily populated, mostly Democratic coast bordering a vast inland red sea. Still, it when came to the overwhelming defeat of Proposition 23 — the ballot measure that would have suspended California’s landmark global warming law — California was a remarkably green state, from Malibu to the Sierra Nevada, from remote Del Norte County on the Oregon border to San Diego. County-by-county election results from the California Secretary of State’s office show a rout of the Texas oil companies bankrolled Prop 23 not only in places like San Francisco (where No forces took 82 percent of the vote) and Los Angeles (with a 67.6 percent No vote) but in conservative, Tea Partying strongholds. For instance, while the inland Southern California counties of Riverside and San Bernardino went for Meg Whitman, the Republican candidate for governor, over Democrat Jerry Brown, they voted No on 23. 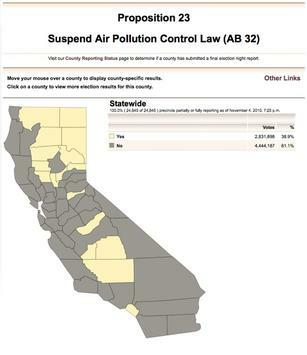 In fact, except for a handful of sparsely populated counties in the far north and center of the state (along with such outliers as Orange County), most of California’s conservative heartland voted to preserve the climate change law that requires greenhouse gas emissions to be cut to 1990 levels by 2020. Even in San Diego County, heavily populated and heavily Republican, 55.8 percent of voters cast ballots against Prop 23. The fact that the No campaign raised three times as much cash as the Texas oil companies and assembled a broad-based, bipartisan coalition of environmentalists, unions, venture capitalists, hedge fund managers, big corporations, and environmental justice activists certainly was key to the election. And the No forces’ message that Prop 23 would kill green jobs seemed to resonate in counties like Riverside and San Bernardino, where the unemployment rate has hit 15 percent this year. Those counties also happen to be home to a large number of planned renewable energy projects. In the weeks leading up to Election Day, state and federal regulators approved big solar power plants that officials estimate will create more than 8,000 jobs in a region where the housing collapse has devastated the building industry. Two weeks before the election, I was out in the Mojave Desert as construction began on BrightSource Energy’s 370-megawatt Ivanpah solar thermal power plant. Over the next three years, Ivanpah will employ 1,000 workers. One of them, Basilio Yniguez, a 36-year-old father of seven from San Bernardino County, told me he had been out of work for a year. “Thanks to the green thing going up, I’m working,” he said. And given that 61.1 percent of California voters voted against Prop 23, that green jobs message apparently worked as well.